3M Document Holders are designed to minimize eye and neck movement by keeping your documents at the proper viewing level. 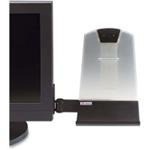 They adjust easily to ensure comfortable, ergonomically correct document viewing! DH445 is designed specifically for use with flat panel/LCD monitors. Mounts on either left or right side. Patented clip enables portrait, landscape and legal paper configurations!